Born in Malaysia, Shian started playing the piano at the age of 5. He began composing music and playing for his local church when he was sixteen. After completing his Bachelor’s Degree in computer science, Shian moved to England to serve on the worship team at Newlife Church. While he was there, he studied audio engineering and music and video production. In 2012, he moved to Kansas City, MO for a four-year ministry course at the International House of Prayer University. After graduating, Shian decided to pursue a full-time ministry by founding Reason To Live, a music ministry that is focused on drawing people to Christ. The album begins with “Dwelling in the Glory - Part 1.” Spontaneously created during one of his classes at the Bible college, Shian felt that the music was a “download from heaven.” Starting out with a gentle, simple melody, it gradually builds in both strength and passion - a gorgeous opening! Feeling that there was more to the piece, Mark composed “Part 2” to express something even deeper: “This is the glory of God, not only peaceful but also powerful and triumphant.” “Creator of the Universe” expresses grace and majesty in a style that is masterful and elegant. The dynamic and very powerful “Man of Sorrows” tells of the journey of Jesus Christ from his birth to the cross. Dark and turbulent through much of the piece, the last section is mournful and quiet. “Watching the Stars” is much softer and more pensive, and recalls Mark’s childhood when he would often sit outside his house at night, looking at the night sky and dreaming about his future. I really like the peaceful nature as well as the dreamy, emotional expression of this one. “Sound of Many Waters” reflects on the many forms of water from peaceful streams, to rain, to the powerful oceans and how the voice of God is heard in the sounds of each. Like the waters themselves, parts of this piece are tranquil and others are “big” and swirling. At 9 1/2 minutes, “The Road to Emmaus” is the longest piece on the album and is about our life journey with Jesus. The title refers to the road where Jesus appeared to his disciples after his resurrection and that they did not recognize him. Deeply emotional and often very poignant, it’s my favorite piece on the album. The album closes with “The New Heaven & Earth” and looks forward with hope and anticipation to Jesus’ return aand “a new heaven and earth.” With an emotional mixture of joy, strength and triumph, it’s a very moving ending to an excellent first album. 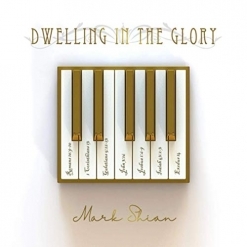 Mark Shian is off to a great start in his music career, and I’m sure that Dwelling in the Glory will get a lot of attention from the various music communities as well as in Christian circles. The album is available from www.ReasonToLive.org, Amazon, iTunes and CD Baby.